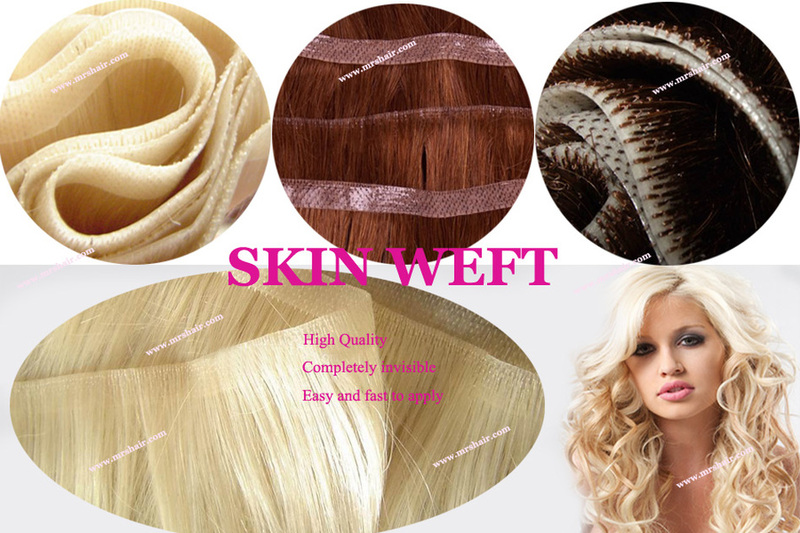 PU skin weft is the latest Hair Extension Systerm becoming more and more popular in many countries. handknotted into a transparent PU band. The PU colors come in transparent or similar to the color of the hair, which giving you a much more natural finish to your hair extension. Skin weft hair extension is seamless without bumps when it is completed. No adhesive is used. No clips or chemicals, it is fast and easy and profitable way of applying extension. The process: Use double side glue tape or glue bonding. When remove it, a non-toxic adhesive remover is used, because skin weft is a more gentle method than other methods, there is minimal hair shedding. In addition, skin weft hair extensions help to protect people's hair from curling irons, blow dryers, styling heat and environmental damage. Skin weft extensions lie flat to the head and feel just like your natural hair. Where to buy Skin Weft Hair Extensions ? Click Here. Item：Skin Weft , PU Skin Weft Hair extensions. Skin (PU) weft: 90cm width of weft and 1cm PU height. Double Tape weft--Tape size is 1.3cmx4.0cm per piece weft. We can also produce by customer's production standard. 6. Mode of shipping: By Express, Plane or Ship. 7. Delivery time: Within 15 days after the receipt of the payment, depend on quantity.